Scratch- and stain-resistant melamine surface. Steel tube support column has levelers to compensate for uneven flooring. Scratch- and stain-resistant melamine surface. Steel tube support column has levelers to compensate for uneven flooring. Not freestanding. Combine with L-Workstation to create a U-Workstation. Click here to see more Peninsulas! 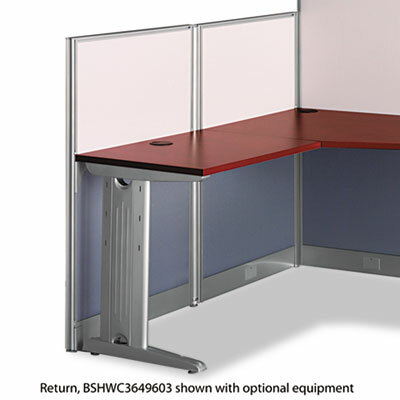 Overall Width: 63" Depth Maximum: 88 1/4"
Base Material: Steel Tubing For Use With: Bush® Office in an Hour™ L-Workstation. Disclaimer Statement(s): Ships in three cartons—ORDER ALL THREE CARTONS. Disclaimer Statement: Ships in three cartons—ORDER ALL THREE CARTONS.